Chelsea and I really enjoy reviewing baby and toddler items. We are always on the lookout for the best products. I really love sharing about which products are our favorites. We really take pride in checking out the different items to see if it is a fit for our family’s needs. Today I will be sharing about the SavvyBaby Stroller Organizer. I feel that this stroller organizer is well made. I love that the cup holders in the organizer are insulated so our drinks stay cold or warm. I do feel that I needs more pockets. I love that there is a case for my cell phone attached that can be unzipped and removed if need be. I also love that the cell phone case has a hole for headphones that is definitely an added bonus. I love that it is available in 2 different color schemes black and chevron. I chose the chevron one so that I can have something a little different then black. I love that this also comes with a snack or toy leash. 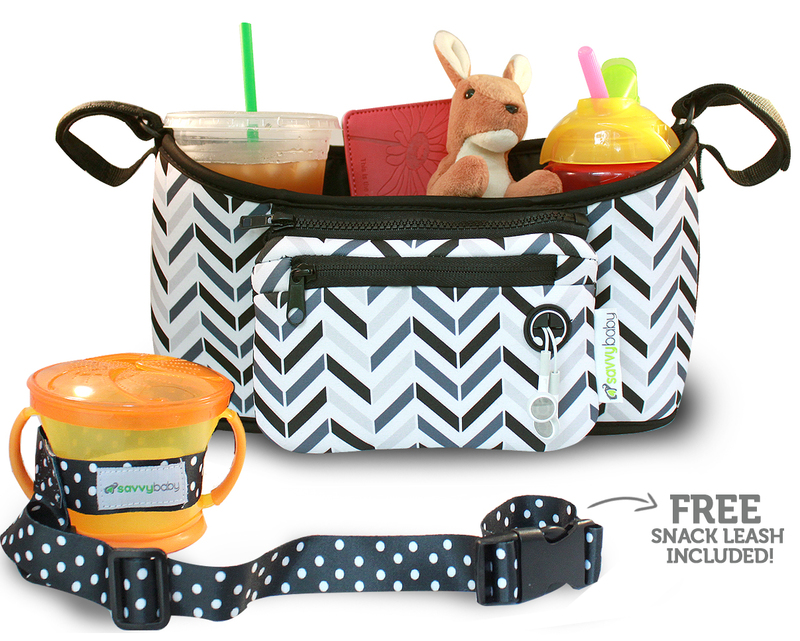 I think its perfect for making sure the toys or snack containers stay put. My daughter tends to drop and throw her things when she gets in her moods. This entry was posted in 2015 Holiday Gift Guide, Reviews and tagged #2015BabyShowerGiftGuide, #2015holidaygiftguide, #holidaygiftguide, #holidaygiftideas, accessories, babies, Baby, baby shower, savvybaby, stroller accessories, stroller accessory, stroller organizer, toddler, toddlers. Bookmark the permalink.